If you live in central or northern California, check out the Pintxo Sauce website for a list of retail locations. If you’re outside the general area, you can purchase via Pay Pal and they’ll ship directly to your door! 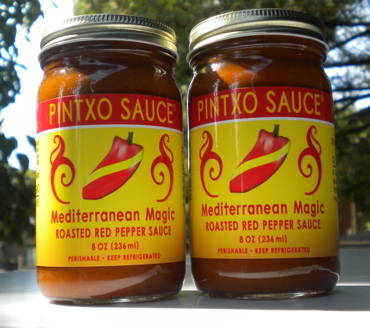 We are proud to feature Pintxo Sauce Mediterranean Magic on our Made in California page … click through to order! Riseful – RollPro Mini: They say most of the great ideas in the U.S. originate in California and work their way east … in the case of Michael Bratcher’s latest innovative photography product, it’s definitely true! Before we share Mike’s introductory You Tube video spotlighting the newly released RollPro Mini, let’s describe it in a nutshell. In short, the Mini was created to easily organize and carry your GoPro cameras and accessories in one compact, lightweight, sturdy, and durable roll up pack. 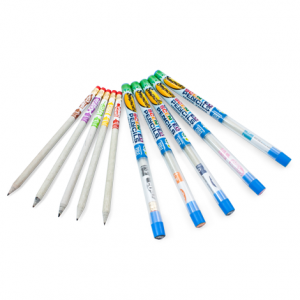 The design allows you to unroll the pack revealing all the contents neatly and safely stored and organized, ready for immediate use at your fingertips! Best of all, every RollPro Mini is hand made in California from U.S. sourced materials. And the attractive, practical, and long lasting design and workmanship will appeal to any GoPro camera user! Golden State innovation at its finest! Soap samplers and gift boxes are available at their website. Homemade soap makes the perfect personal gift – ideal for someone with a soft spot for The Golden State! 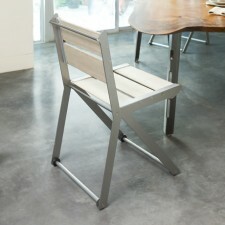 An economical, practical, and sure to be appreciated gift idea – Made in Los Angeles! 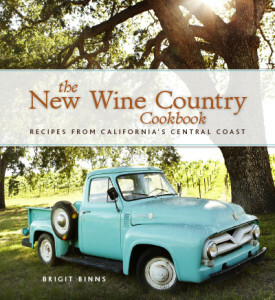 At Brigit’s website, you can check out her entertaining blog “Road Foodie” and order her books for yourself or as a sure to be treasured California gift. Just click on the “Books” tab and then the book’s title – you’ll be taken directly to an order page. If you’ve got a foodie or wine lover on your list, this is an attractive and affordable gift idea! 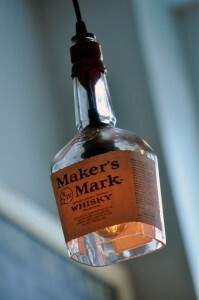 They receive a steady stream of bottles from bars and restaurants around Claremont and can supply the individual customer as well as bars and restaurants seeking an unusual and unique lighting theme. The company also does custom orders and can take a bottle which you supply and turn it into a treasured piece of home decor. There’s a link to their Etsy store for individual consumers as well as contact link if you’ve got a custom or large scale order. By the way, some of the creative scents you can buy are juicy lemon, cherry vanilla, blackberry, pear, Kinda Cola, and razzleberry … check their website for all the details! Oxgut Hose Company: We love creative small companies who repurpose unwanted items into something useful … and here’s a California company doing a great job of it! Grow Your Own Sequoia Tree Kit: What a great idea for a family project or a school science project! The Sequoia tree is one of California’s most famous tree species, along with the redwood. Now you can grow your very own Sequoia sapling from a handy kit (costs less than $20) which includes all the materials and directions you need to grow a Sequoia sapling. These hearty trees grow just about anywhere in the United States! It’s the indoor mushroom kit, which contains everything you need to grow your very own fresh mushrooms at home in 10 days. The kit is a self contained box which you simply place in indirect light, mist daily, and harvest! The kit won’t spoil and produces about a pound and a half of fresh oyster mushrooms which are excellent for stews, salads, and stir fry dishes. 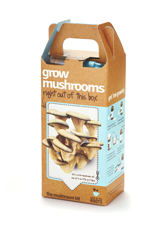 You can get as many as ten “crops” of fresh mushrooms from each kit … very reasonably priced and a great gift! Back To The Roots has been featured by Oprah and Martha Stewart and other national publications in addition to here at State Gifts USA. They also make an Aqua Farm, a self cleaning fish tank that also grows edible plants … just fill with water, add your pet fish, and plant seeds! Not only will you find some beautiful jewelry personally designed by Jes, from classic to whimsical, but you’ll also find jewelry containing birth stones for all 12 months of the year. Birth stone jewelry is the perfect gift, and these stones on gold and silver loops allow you to wear them with your favorite necklace. 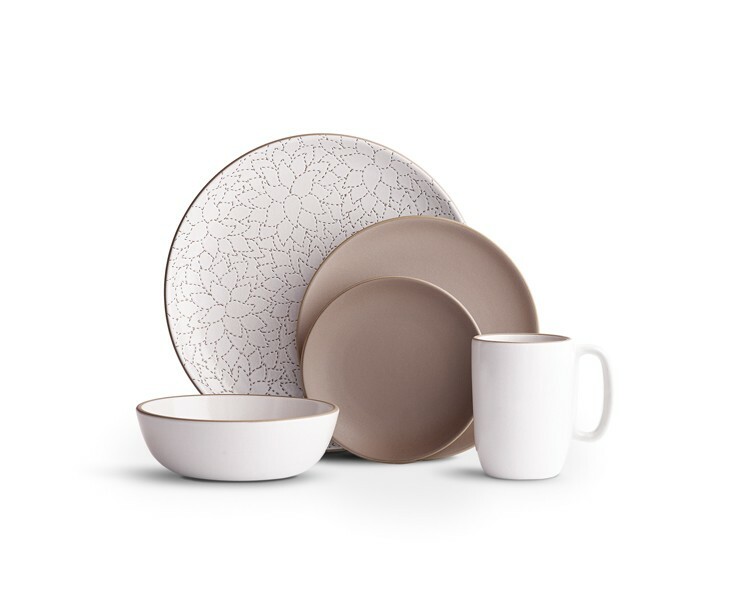 Heath Ceramics is not only noted for vases, pitchers, pots, and dinnerware sets (shown), but it is also famous for glass blown items and decorative items. Heath is also one of the largest house number producers in the country. 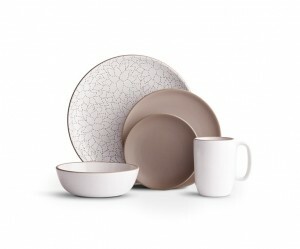 You can shop the Heath Ceramic collections at the Heath Ceramics website … an ideal gift from the Golden State! Anchor Brewing Company: Before there was craft beer, there was Anchor Steam. A San Francisco (and now national) treasure since 1896, Anchor Brewing Company was on its last legs in the mid 1960’s until it was rescued by Fritz Maytag of the Maytag appliance family fame. And if that is indeed the case, I’ve been a member of the Anchor Steam cult ever since! 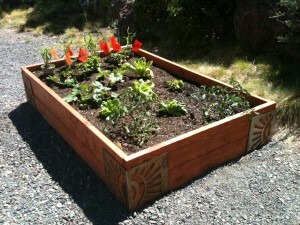 The California Redwood Company offers all kinds of California redwood products to the general public. It’s worth visiting their site even to simply learn about these majestic trees. The company practices sustainable forestry policy and plants more redwood trees than are forested. 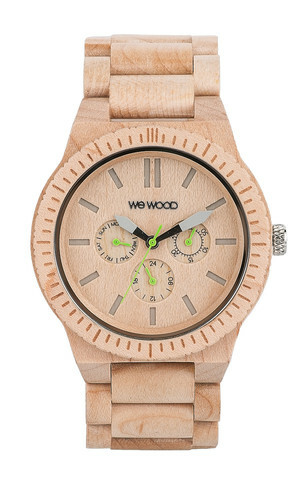 Nothing is wasted in the manufacturing process, from the bark all the way down to the sawdust! Fortunately, certain small producers have been able to distribute their wines on a rotating basis to penetrate the national market. 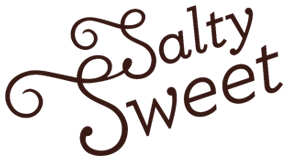 Doing so brings the wonderful wines of smaller producers onto a more level playing field with mega wine companies, and gets them into the hands of the wine loving public. 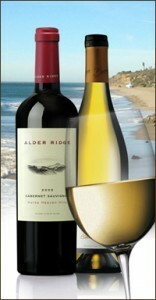 Experience the best of California as a gift or simply to enjoy yourself! Made With California Apricots, Peaches, Nectarines, Dates, and Almonds! 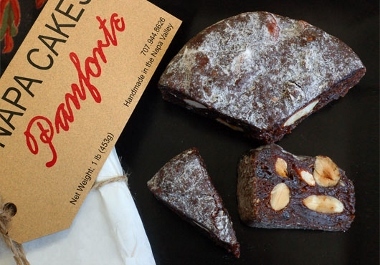 Further, Napa Cakes Panforte’s products are gluten free and made without eggs or dairy. Just good-for-you California nuts and fruit! Best of all, these delightful treats are very versatile … enjoy them as a mid afternoon pick me up snack, satisfying dessert, or even for breakfast. They’re available in half and full pound sizes at the “Order Panforte” page at their website. 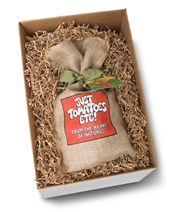 Special gift packaging and wholesale opportunities are available as well … check the site for full details. 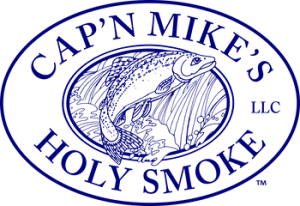 That’s why we’re pleased to introduce Cap’n Mike’s Holy Smoke of Rohnert Park, CA. 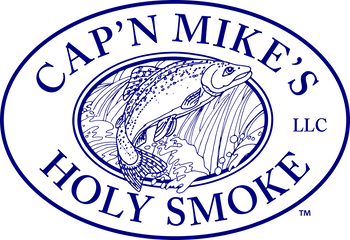 They’re exactly what you’re looking for in smoked fish from The Golden State … they catch it, smoke it, package and ship it! Gift boxes are available too for your holiday shopping convenience … or any time of year for that matter! 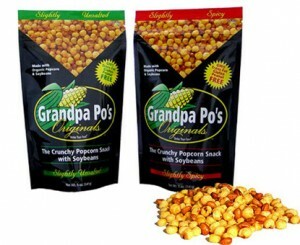 They’re 479 Degrees, a popcorn making business founded and operated by San Francisco resident Jean Arnold. Jean names her company after what she determined is the optimal temperature for cooking popcorn – and who’s to argue with great results? We hope you get a chance to try some of the wonderful flavors 479 Degrees is creating. 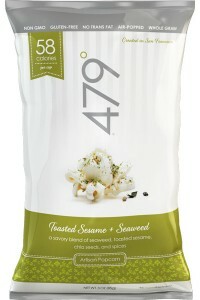 Pictured is one of their unique varieties, Toasted Sesame & Seaweed, a real California treat. Others include Asiago, Parmesan, & Cheddar, Farmers Market Herbs, Toasted Coconut Caramel, and more. There are nine year around flavors available, and a few Limited Edition runs like the Dark Chocolate & Bing Cherries Popcorn, which is nothing short of spectacular! Great stuff from San Francisco! 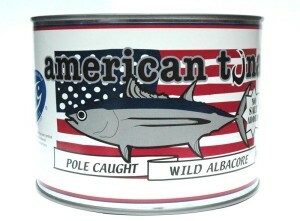 Wild albacore tuna is one of our favorites. We’re not talking about tuna fish in the can at your grocery store – this tuna is more like large chunks of fish loin with no added water, oil, salt, or other additives. The company produces an full line of soft ripened goat cheese ranging from subtle and creamy to bold and complex. 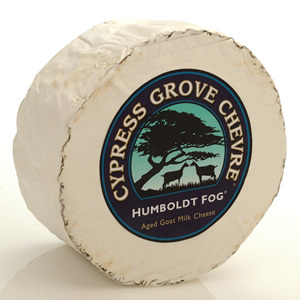 At their website, you’ll find full descriptions of all the Cyprus Grove Chevre flavor profiles, as well as some fun and innovative recipes to help you enjoy their cheese. You can purchase these specialty cheeses directly at their site, or use the handy store locater function to find a retail outlet near you that carries them. Cheese makes a wonderful gift for anyone on your list, so click through and order for a friend or just for yourself! Sun Bud Bakery: Meet San Francisco’s Sun Bud Bakery, who are doing a marvelous job introducting people to their unique buckwheat cookies. Despite the name, buckwheat is completely wheat free and isn’t even related to wheat. Buckwheat is the triangular shaped fruit of the buckwheat plant and carries a hearty, toasty flavor. It’s also gluten free and an excellent source of protein. The Bakery creates two types of buckwheat cookies – Buckwheat with Apricots and Buckwheat with Chocolate and Currants. Both are wholesome and satisfying, but not too sweet – each cookie contains only four grams of unrefined sugars. You’ll find these cookies available in the Bay Area as well as via the Sun Bud Bakery online store. Mixed boxes and gift boxes are available too! Love & Hummus: This San Francisco business is the Bay Area’s only certified organic producer of hummus and Mediterranean foods. Using California grown chickpeas from a local organic farm, their hummus is vegan, high fiber, low sodium, extremely good for you … and by the way tastes great! Available in four different varieties, Love & Hummus packages their products in glass jars to retain optimal flavor and encourage recycling. You can order the four flavors at their website – Classic, Spicy Harissa, Carmelized Garlic, and Roasted Lemon & Thyme are all available to you. Visit the Love and Hummus website and click on the “Find Us” icon. The drop down menu will show an Online Store as well as where to buy locally. Their four jar sampler pack makes a great gift for the foodie on your list! Salty Sweet: This San Francisco based small business owned and operated by Melissa Cohan does one thing and does it right … chocolate chip cookies. But these aren’t just any chocolate chip cookies. They’re literally “salty sweet” – rich and flavorful chocolate chip cookies sprinkled with sea salt to create the unbeatable flavor combination. A simple idea – and so incredibly effective! The cookies, available at the Salty Sweet website, are packaged in three ways – in a Signature Stack (10 cookies), a bag of Minis (smaller size but still 10), and Mighty (larger size, 3 cookies). Click through to their website to learn more and to place your order! 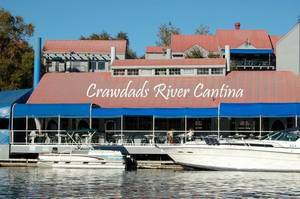 One of their many specialties is Stone Crab Claws, caught just offshore. A little sweet and a little salty, their fresh flavor will leave you clamoring for more. Ditto the plump Wild Diver Scallops and the Santa Barbara Spiny Lobsters, also from area waters. Fish just doesn’t get any fresher! 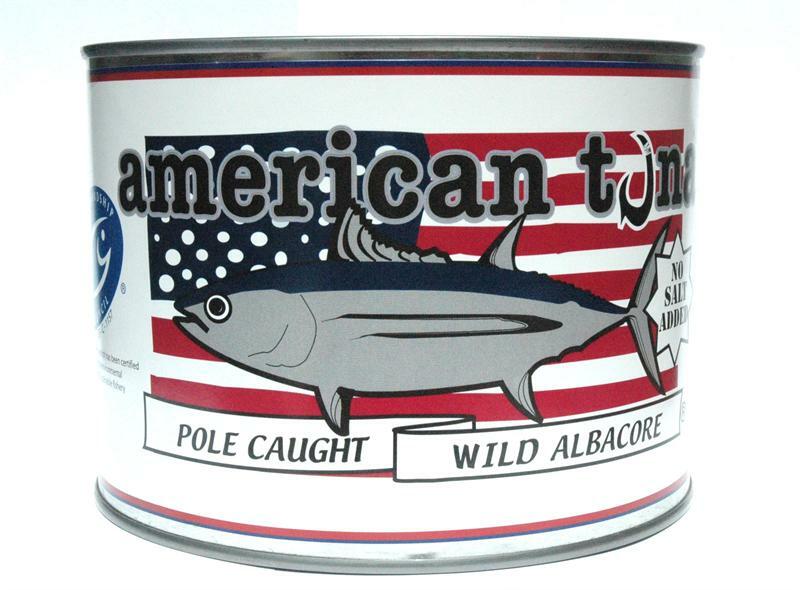 Perfect as gifts for any occasion, the Fish Market will ship anywhere in the United States. Smoked fish, ceviche, and special homemade tartar sauces are available as well. Click through to check out your options and to order! The calling card of this small business is freshness – the produce being used to create their jams was likely still growing in the field the day before. 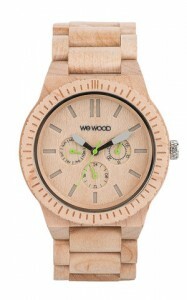 That’s the advantage of sourcing locally, and the difference shows in their creative product line. At their site, you’ll discover creative flavors like Pink Grapefruit & Mint, Tangerine with Rosemary and Sage Honey, and Black Mission Fig with Fennel. James are rotated seasonally, as are their many pickled items like Smoky Broccoli, Indian Lemon Pickles, and more. Flavorful gifts Made in Southern California – sure to be appreciated by anyone on your list! 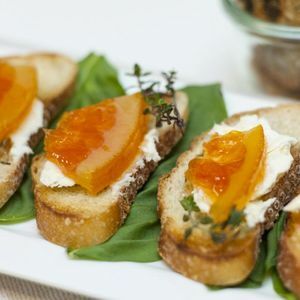 Apricot, Raspberry, and Strawberry Fruit Spreads lead off the product line, which also includes Spicy Dill Spears and Turmeric Cauliflower Pickles. We love the flavor of turmeric and had never heard of it being used in this fashion before! Emmy’s also offers Bread & Butter Chips and Whole Dill Pickles, and you don’t need to be in California to get them – you can order directly at their website. The company has been featured in San Francisco Magazine and was the recipient of a Good Food Award, so click through and see what all the buzz is about! The chip bag pictured are Earthquake Chips, which are gaining a cult following. They’re a combination of several flavors in one bag, all blended together … maybe it causes a shake, rattle, and roll to your taste buds! Pacific Pickle Works: Based in beautiful Santa Barbara, this small company specializes in all natural hand packed pickled vegetables using produce grown in The Golden State. Cauliflower, okra, beets, green beans, and carrots receive the same creative pickling process as cucumbers – their product selection is unique and inventive! At their website, you’ll see what we mean. Beets (known as “Unbeetables”), and carrots (“Carriots of Fire”) are hand packed in a spicy brine to give these humble vegetables a gourmet touch, perfect for use in recipes or as part of an appetizer tray. Undoubtedly though, the pickles are the star of the show. Cukarambas are spicy quartered cucumbers packed with dill, and Bread & Buddhas are tangy sweet pickle chips seasoned with mustard seed, peppercorns, and onions. 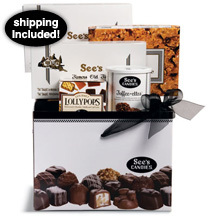 Looking for a gift your recipient can enjoy all year around? Take a look at Pacific Pickle Works Pickle Club, a quarterly shipment of four jars of seasonal pickled products sent directly anywhere in the country. If you like a good Bloody Mary, consider their mix or a Bloody Mary Kit, complete with pickled garnishments to make the perfect cocktail! 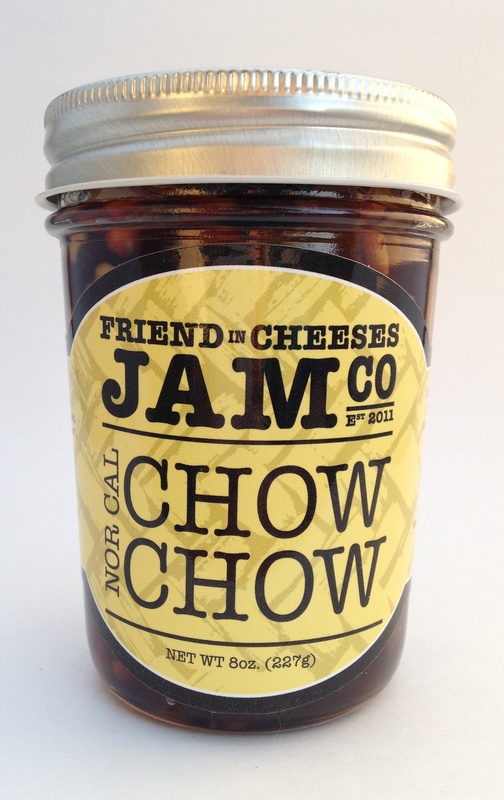 Friend In Cheeses Jam Company: Located in Santa Cruz, this local, seasonal jam company is owned by Tabitha Stroup, who had been preparing homemade condiments for various endeavors for over 20 years. She founded her first jam company in 2009 and building on its immediate popularity, founded Friend in Cheeses two years later. 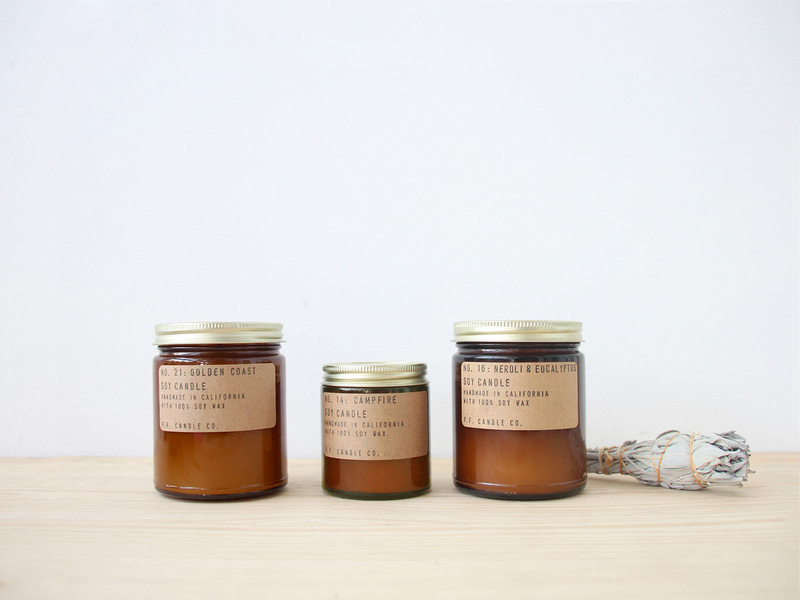 Her company produces jams, jellies, and preserves from local organic farm sourced ingredients. And these aren’t ordinary creations! 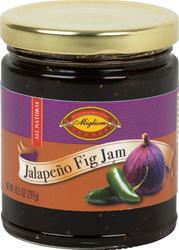 How about Fig & Fennel Jam, Carrot Marmalade, and Tart ‘n Spicy Tomato Jelly? 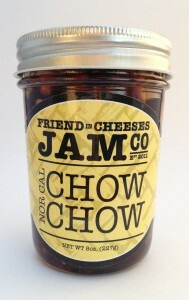 Tabitha also creates her take on a traditionally southern condiment, chow chow, with her NorCal Chow Chow. Unlike any other you’ve tasted, it features honey, bourbon, vanilla, sea salt, and organic cherries, raisins, cranberries, almonds, sunflower seeds, and more. Wow! Check out the Friend In Cheeses website to see all their products … and more are on the way! Order for yourself or as a wonderful taste of Santa Cruz County gift at the Online Store. Great products from the Central Coast! 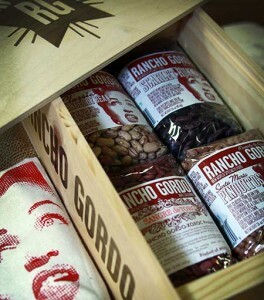 Rancho Gordo works with growers in northern California to develop the foundation of their product line – heirloom beans. These are distinct types of beans grown in small quantities to ensure quality and freshness. While there are actually hundreds of varieties of heirloom beans, not many are available or even known as beans in large measure have been reduced to a mass quantity product. Pernicious Pickling Company: This small company, founded in 2013, is a great example of ingenuity and initiative. 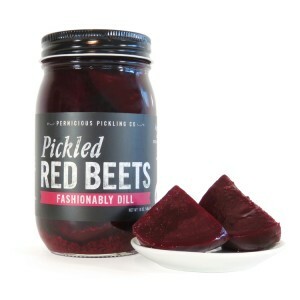 Founded and owned by California couple Kendra Coggin and Baron Conway, the business was started because the two couldn’t find any really good California based pickled products like they remembered growing up. The solution? Made the products themselves and start a company to sell them! The end result is the Pernicious Pickling Company, based in Costa Mesa and featuring an initial line of ten different pickles. The product line has since expanded to a whole bunch of other pickled delights, from beets to beans, carrots, and cauliflower. If you’re a fan of pickles like we are, you’ll love reading about and enjoying their many varieties, like Garlic Dills, Bread & Butter Sweet Pickles, and Extra Spicy Dills, pickled with habanero peppers. Their site offers numerous serving suggestions and reinforces the concept that pickled vegetables aren’t just for sandwiches any more! And how right they are – their Pickled Cauliflower was featured in Food & Wine Magazine recently and one serving idea is to stir it into potato salad with peas and bacon … oh yes! Pernicious Pickling is picking (or is that pickling?) up speed and their products can be found in many locations across California, as well as online at their site for shipping to your home or a gift recipient. What a cool culinary gift idea! 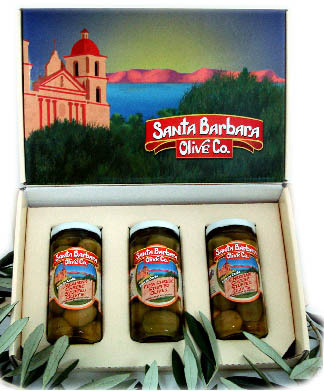 Santa Barbara Olives are found in artisan stores across the country. They offer a store locater on their website to find a store near you. Or, click through to their site to order online, and don’t forget to visit the Gift Store page for some great holiday ideas! 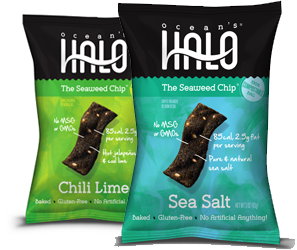 Ocean’s Halo Seaweed Chips: For as long as we can remember, we’ve always gotten a big kick out of trying potato chips made in different areas of the country. The different flavors, textures, seasonings, and crunch have always drawn us in. Now, walking down the grocery aisles, you’ll see a lot more variety in chips … including what they’re made from. We weren’t sure what to expect of the taste, but they’re delicious! Sturdy and very easy to dip, they come in four flavors for the time being with more on the way. You’ll find them in specialty food stores and via an online link on their website in Sea Salt, Chili Lime, Hot & Spicy, and Korean BBQ. 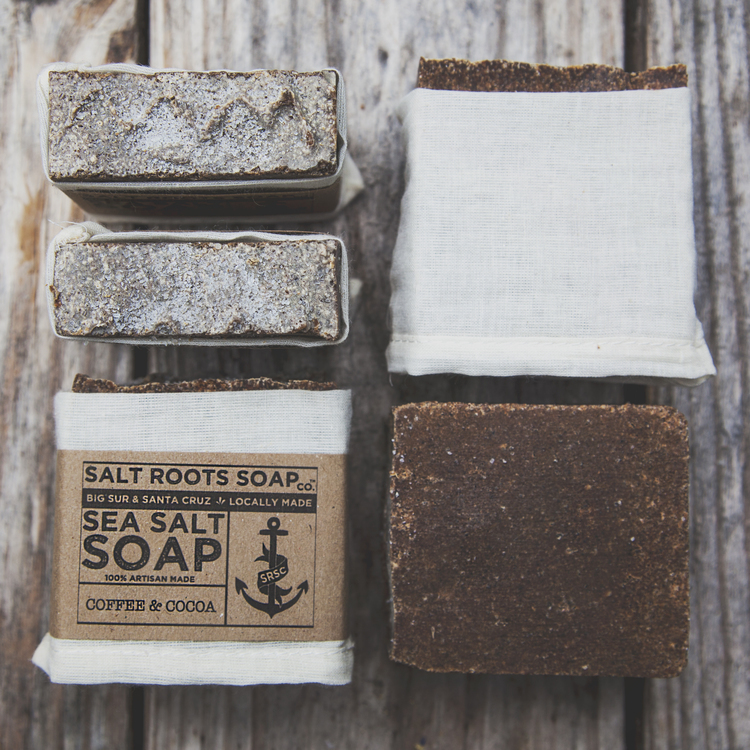 We tried the Sea Salt variety and served them at a recent gathering and they were a big hit! Learn more about Ocean’s Halo Seaweed Chips at their website and watch for them at a store near you! Visit the Migliore Gourmet Foods website and online store and order a gift for the person in your life who deserves “the best”! Rusty’s Chips are made in Huntington Beach and there really is a Rusty … in fact, the chips are made in his own small chip kitchen. Everything is done by hand. California potatoes are sliced one at a time in a vegetable slicer and then slow cooked in safflower oil. The chips are then lightly salted with sun dried sea salt, weighed and bagged by hand and sealed. The result is a decidedly natural tasting chip, not at all like mass produced potato chips. 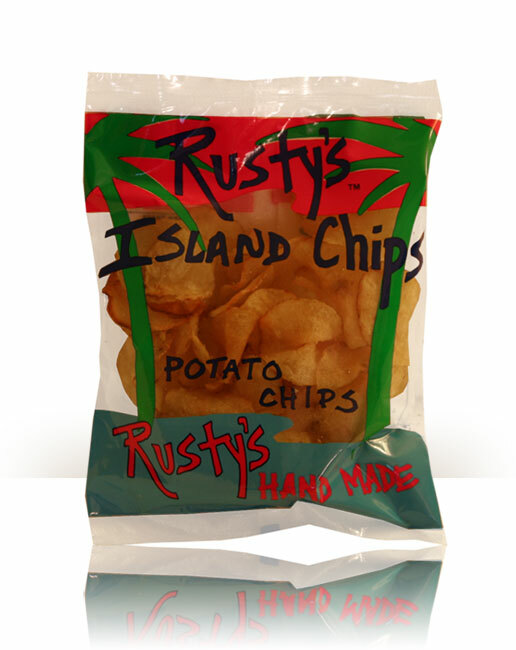 Rusty’s Chips may be hard to find, but when you do, you’ll love their fresh, delicious crunch! You can learn more about this small Golden State enterprise and more importantly order Rusty’s Chips at his website linked above. They can be bought in half cased or cases … you’ll go through them in no time! They’re available in lightly salted and slightly spicy varieties. They’re also quite healthy for you … no additives, preservatives, or anything artificial. You can order a few bags at their site … they’re unique and delicious! The company makes dozens of condiments, nut butters, vinaigrettes, jams, cooking sauces, and even cocktail mixes! 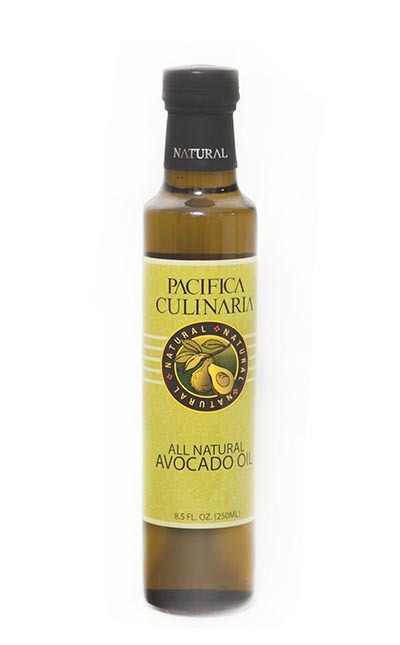 Pacifica Culinaria also makes agave syrups, condiments, and infused vinegars … it’s a great one stop shopping destination for the amateur or professional chef in your life! 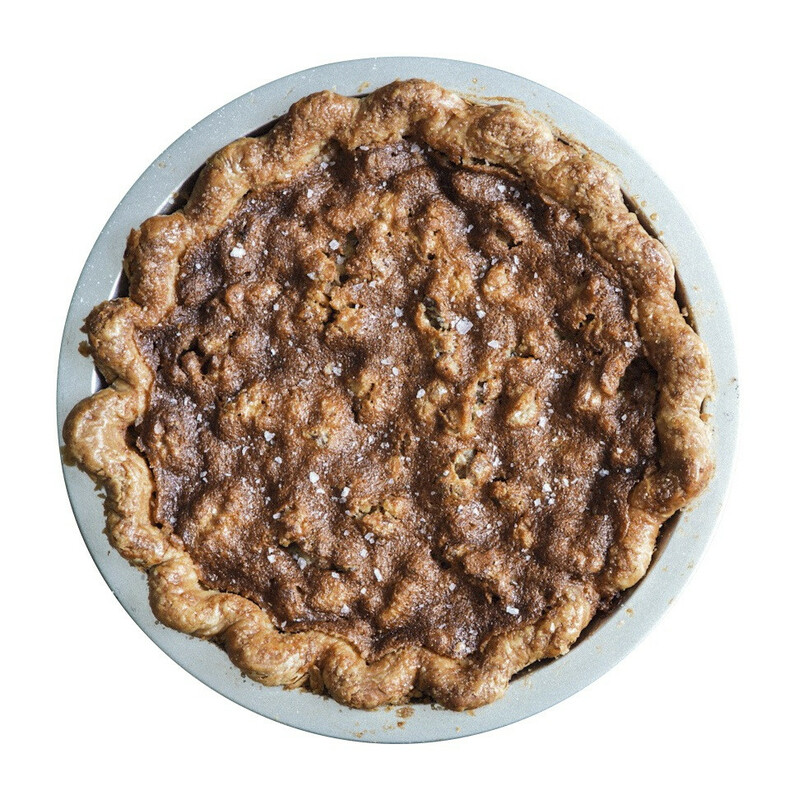 Three Babes Bakeshop: This small San Francisco company is in the business of baking pies, but not just your ordinary run of the mill pies – spectacular “I’ve never had one better” pies! If you live in and around the city, you can pre order pies for pickup at their website, but if you’re not a California guy or gal, not to worry. 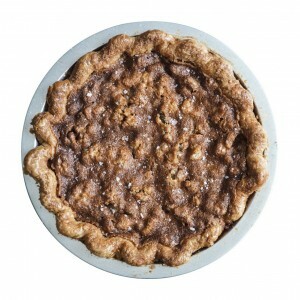 Three Babes has instituted a Pie By Mail program and even a Pie By Subscription offer – you can get their Salty Honey Walnut, Bittersweet Chocolate Pecan, or Bourbon Pecan pies shipped anywhere in the country. This small business is making quite a name for themselves – check them out and taste the deliciousness for yourself! Specializing in toffee and sea salt caramels, this innovative small company pushes the flavor boundaries with varieties like Chile Verde Salted Caramels and Island Style Macadamia Nut Toffee with White Chocolate. 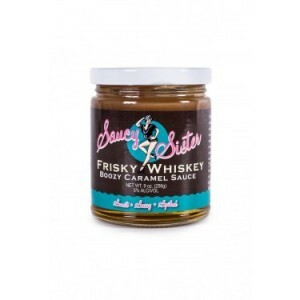 They’re also known for their spectacular caramel sauces, most notably Frisky Whiskey Boozy Sauce, made with caramel, sea salt, butter, sugar, and whiskey – your ice cream and bread pudding will never be the same! Visit their website to see all the different gift options for business, good friends, or just yourself. Creative confections direct from the beautiful town of Leucadia! Plush Puffs: Remember when marshmallows were only white spongy cubes you bought in a plastic bag at the grocery store? You can roast them for a unique twist on s’mores or melt one or two atop your coffee or hot chocolate. The marshmallow’s flavor intensifies when roasted, so go ahead, use a few in your best dessert recipes or as a topping for pie slices and baked goods! 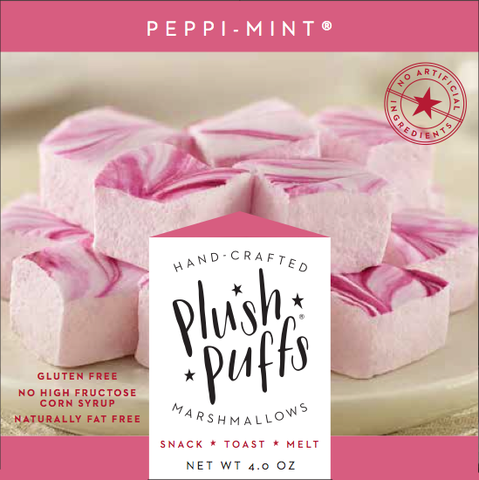 Plush Puffs come in a variety of flavors – Caramel Swirl, Lemony Meringue, Toasty Coconut, and Vanilla Bean just to name a few. They arrive about 16 – 18 per package and they’re a wonderful addition to any sweet table display! For larger gatherings, check out their Gifts page. You can order a “Pick Six” box or a Party Box which includes 12 different flavors. 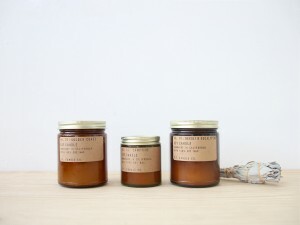 And who wouldn’t like to receive artisan marshmallows as a special sweet gift?? 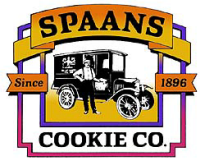 Spaans Cookie Company: The Spaans Cookie Company traces its roots back to Holland in the late 19th century, eventually settling into the Sacramento Valley in 1958. A true family owned and operated business, Spaans makes over 50 different cookie varieties and can bake over 1 million a day! 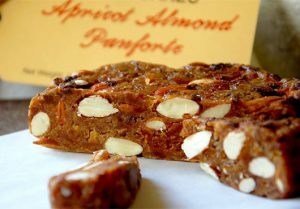 You can have any of the items available at the Spaans online store shipped directly to you or to someone on your list – a tasty California made treat anyone would love to receive! Sacramento Cookie Factory: This unique Czech heritage baking company makes a traditional European treat known by Czechs as “Oplatky”, a thin wafer cookie traditionally given as gifts for best wishes and good luck. The owner of the company, Jiri Knedlik, is a former citizen of then Czechoslovakia who escaped with his family when the country was under Communist oppression. Settling in Sacramento, he uses a family recipe from the famous spa town of Karlovy Vary in what is now the Czech Republic to make these time honored wafers. Even today, each wafer is hand made, baked, and aged twelve days. The wafers are then filled with natural filling and baked again. The result is delightfully light, crispy flavored treat which pairs exceptionally well with tea, coffee, and especially wine! Sacramento Cookie Factory creates several different flavors of wafer cookies, including Vanilla Almond, Mocha Hazelnut, Lemon Vanilla, Mocha Chocolate, and Raspberry Almond. For a really unique California gift, order their Sacramento Wafer, flavored with cinnamon and hazelnut. 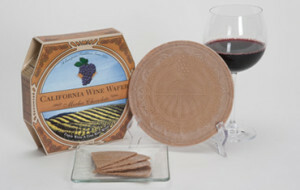 The wafer’s design depicts the state capitol building in Sacramento! Sun Flour Baking Company: This new baking company has settled into an interesting niche … vegan friendly baked goods. 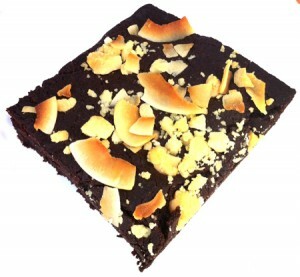 Shown is a coconut fudge almond brownie, which is 100% vegan … no wheat, dairy, eggs, or hydrogenated oil. See’s has expanded throughout the west over the years. 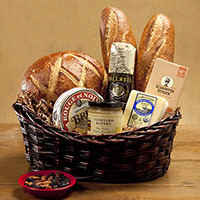 They’re well known for their gift baskets and gift packs, including business gifts and special occasion remembrances. 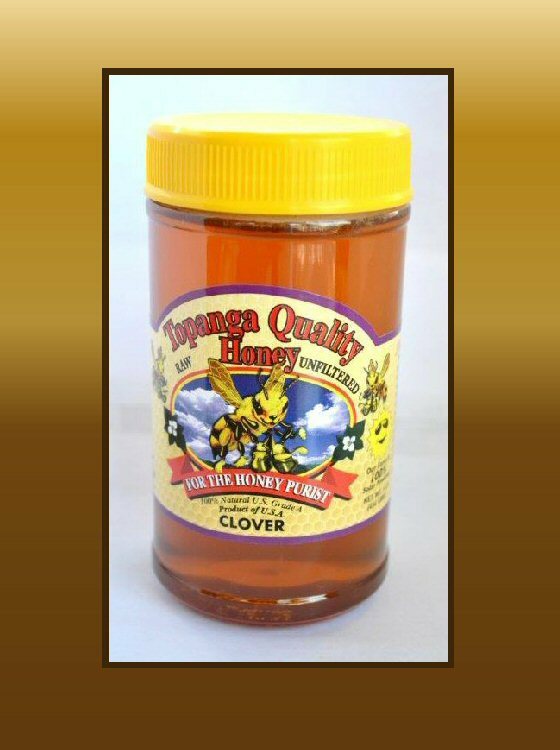 Bennett’s Honey Farm: Here at State Gifts USA, we’re such big believers in raw, natural honey that we try to list at least one local honey producer from every state if possible. Recently we noticed a void on our Made in California page so we’re pleased to introduce you to Bennett Honey, a busy producer of honey and related products located in the heart of Ventura County. The Farm’s honey is 100% pure raw gourmet honey, so all the health benefits are intact. Local honey is fantastic for local seasonal allergies and it’s a natural sweetener that provides a gentle but effective energy boost. If you’re looking for a California made gift or just something healthy and delicious for your own kitchen, click through to the Bennett Honey Farm website to see what’s currently available. A great natural choice from The Golden State! Lucille’s Bar-B-Que: On our never ending nationwide hunt for America’s great barbecue, we became acquainted with Lucille’s Bar-B-Que, a small chain of fun, casual restaurants scattered across southern California. Rubs, spice mixes, and Lucille’s Smokin’ Sauce (a hot sauce) are available as well. Click through to their site and you’ll see a “Shop” tab … better yet, stop by one of their many SoCal locations and try them out for yourself! Really good barbecue from California! 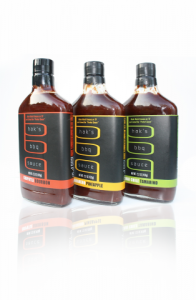 Determining it was time to share his sauces with the public, Sharone founded Hak’s BBQ to create an inspired line of gourmet barbecue sauces. Hak’s makes four varieties and their popularity has exploded – they’re now available in Whole Foods, Vons, Harmon’s, and many other groceries and specialty stores across the country, as well as online at their site. 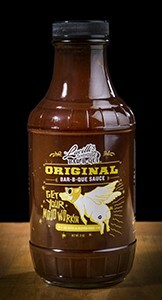 The four sauces offer flavors you won’t find in other standard barbecue sauces, like Chipotle Bourbon, Smoked Maple Mustard, Thai Chile Tamarind, and Habanero Pineapple. 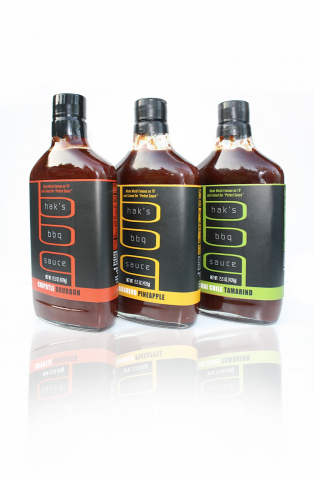 More than just a barbecue sauce, you can use any of the Hak’s flavors as dipping sauces, glazes, marinades, or in recipes. We used some of the Habanero Pineapple mixed in with a stir fry – outstanding! You can order individual bottles of any flavor at the Hak’s online store, as well as a convenient mix and match three pack. Click through to learn more about these uniquely special sauces! Art of the Garden: This Woodland, CA company created an ingenious method to help gardeners create raised garden beds … they’re called M-Brace and as you can see by the picture, they’re four steel braces designed to hold sheets of wood together. Made of 100% recycled steel, the M-Braces come in two sizes depending on your gardening space. All you need are four lengths of wood to fit into the M-Braces and you’re ready to garden! Lamp In A Box: This Golden State company was founded in 2007 with the goal of redefining people’s perceptions of table lamps … and we think they’ve succeeded! 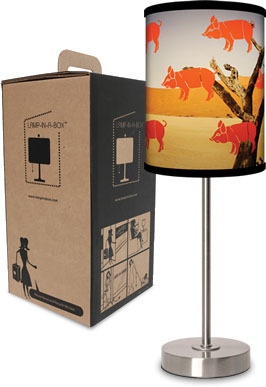 There are hundreds of designs available, including retro advertising images, musical themes, American painters, sports, transportation, travel, and much more … you can also choose from various styles of lamp bases to match your desired taste and decor. Lamp In A Box also has an exclusive “Design Your Own” area where you can have a little fun with your creative side designing the table lamp of your dreams! Take a look at their website and see all the eye catching designs and order one for yourself or as a gift! Tapatio Hot Sauce: Tapatio Hot Sauce has been first a California staple and then a national sensation … you can probably find this unique sauce in your local grocer. 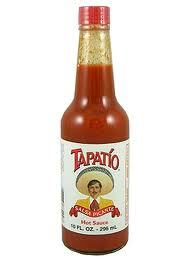 In case you can find Tapatio in a store near you, you can have it shipped directly to your home or as a gift from Tapatio Hot Sauce. 3). Los Angeles is the most populous city in the state. San Diego is second, San Jose third. 11). Lake Oroville is California’s deepest lake at 695 feet. It is located about 75 miles north of Sacramento. More California Made Products To Come … Tell Us About Your Favorites By Commenting At Our Contact Us Page! Welcome to Part Five in our State Gifts USA series, “Visiting America’s State Capital Cities” series. We’ll be providing overview travelogues for all 50 American capitals alphabetically by state, drawing upon our own travel experiences and those of trusted close friends. Each travelogue provides a general overview of the city, its attractions, and our recommendations of what to do and where to enjoy a good meal. We’re advocates of “going local”, so you won’t find many five star recommendations … we figure you can find all the pricey restaurants on your own! We also gravitate toward the historical, especially when it comes to restaurants, so expect to read about visits to eating and drinking establishments that have stood the test of time and are revered by the local community. You’ll also learn about each state’s State Capitol Building, just in case you’ve got a bucket list to someday visit all 50! When we told a few friends we were planning to spend a few days in Sacramento, their reaction could best be described as quizzical. Now granted, we live in the Midwest but no one we talked to knew anything about this city, known as The City of Trees. 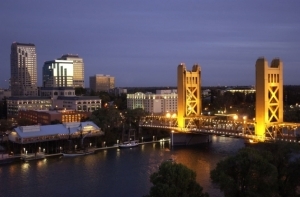 The city itself is home to close to a half million people, and the surrounding county (Sacramento County) has a population of about 2.5 million. The county is amidst a rich agricultural area, giving rise to the city’s reputation as the farm-to-table center of California. To be sure, there’s no shortage of wonderful cuisine served here … the biggest problem is deciding where to eat and which places make the cut! 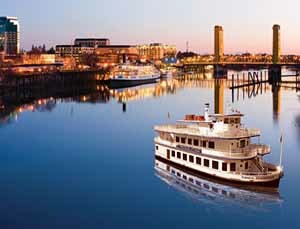 Sacramento is actually closer to Wine Country than San Francisco, making it an ideal launching pad for a wine sojourn. There’s plenty to sip in Sacramento County on its own though – the area is home to over 200 wineries and dozens of craft breweries and brewpubs! The weather here is, in a word, delightful! Sacramento enjoys a mild Mediterranean climate with an average yearly temperature of 61 degrees. Summers don’t get too hot and winters are moderate. Outdoor activities are part of every day Sacramento life – it’s an excellent place to run, walk, and bicycle. The city itself is fairly easy to navigate – there is ample light rail if you favor public transportation and Amtrak trains stop here daily. Two rivers flow through town – the American and Sacramento. They can get you turned around a bit if you’re unfamiliar with Sacramento’s layout but it’s nothing a little map studying can’t fix. As mentioned, there’s plenty to see and do here – so let’s get started! 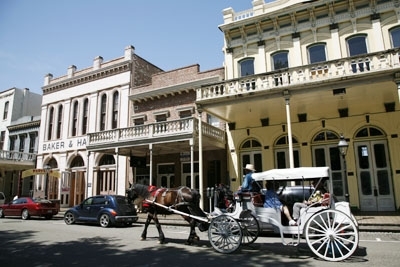 If you have limited time to spend here in the city, one of the areas you’ll want to see is the Old Sacramento district. 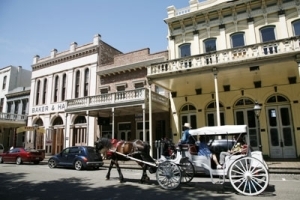 Located along the riverfront on 28 acres, Old Sacramento was founded in 1849 and is a site of great historical significance. This is essentially where the Gold Rush started, and the area was the western terminus of the Pony Express. If you’re a fan of eclectic independent shops, Old Sacramento is where you want to be! The area is flush with dozens of retail outlets and is refreshingly devoid of large chain operations. You’ll find everything from unique clothing and accessories to home furnishings and antiques. Most stores are clustered around the area’s main drag, Front Street. To keep things easier for the navigationally challenged, cross streets are adorned with letters of the alphabet, i.e. J Street, K Street, etc. As mentioned above, Sacramento is an outdoor activity paradise. It owes this reputation to the city’s generally agreeable climate and the emphasis on walking and bike trails along with the Sacramento and American Rivers. Kayaking, canoeing, a a variety of competitive and non competitive running events are commonplace here, so don’t forget to bring your running shoes! For some indoor entertainment in historic venues, try to catch a movie, show, or concert at one of three notable Sacramento theaters. 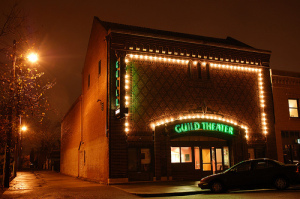 There’s the Tower Theater, built in the 1930’s, on Land Park Drive where you’ll find independent films being screened and the 100 year old Guild Theater on 35th Street (shown) for movies and concerts. Another is the historic Crest Theater on K Street for more of the same – it was built just after World War II. For a true local’s place, you won’t go wrong at the Squeeze Inn, famous for their cheeseburgers with the crispy cheese lopping off the bun. They were featured on Diners, Drive In’s, and Dives. They’re located on Power Inn Road on the southeast side of the city and in addition to their renowned burgers they grill up a fine grilled cheese sandwich as well! 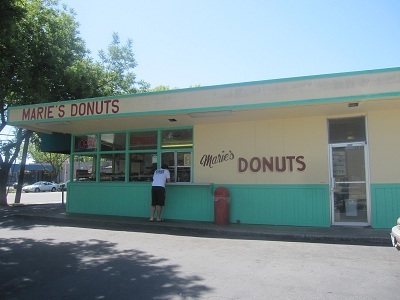 For breakfast, another Sacramento original is Marie’s Donuts on Freeport Boulevard. Primarily serving the late night crowd, Marie’s opens up at midnight and stays open until early afternoon. You don’t need to come here after midnight … there’ll be plenty left during the traditional breakfast hours! You will want to try one of their famous Blueberry Buttermilk Donuts, though. Quite possibly the best donut ever! Marie’s Donuts: The Best Donuts In Town! Sacramento, despite being the capital city of one of America’s biggest states, is a bit off the tourist and visitor track. And maybe that’s the way the city likes it! The fun thing about Sacramento is you can spend as much or as little time here as your schedule and interests allow. Yes, there’s plenty to see and do here but you can indeed get a bare bones feel for the city in a full day. 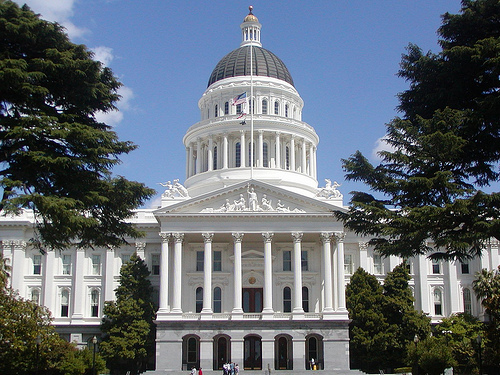 Of course, you’ll want to dig a little deeper to fully appreciate why Sacramento is known as the true California experience!